The current U.S. Military Specification, A-18001K, is the result of extensive studies and experimentation carried out by corrosion scientists for more than forty years. Prior to the mid 1950s, corrosion prevention for underwater hulls and fittings, based on zinc sacrificial anodes, was not particularly reliable. No one could explain why one vessel using these anodes would suffer little to no corrosion of its underwater metals while another similar vessel using zinc anodes that appeared to be the same would receive extensive corrosion damage. Subsequent studies indicated that some zinc anodes did not remain electrochemically active, becoming relatively inert (passivated) over time due to a buildup of a dense, tightly adherent film on the zinc's surface. The passivating film's principal constituents were oxides of iron and the source of the iron was the elemental iron present in the zinc when the anodes were manufactured. These studies determined that the maximum allowable iron content for reliable sacrificial zinc anode performance was 0.0014 percent. Hence, the first U.S. Military zinc anode specification, A-18001A, was born. This specification also limited several other contaminating elements such as copper and silicon, but excessive iron was the main cause of anode passivation. To produce anodes that met the specification, manufacturers had to start with the purest grade of zinc available from the smelters (Special High Grade) and not contaminate it while producing the anodes. This was, and is, very difficult to do. Work continued on the problem over the years with metallurgists seeking an alloy that would perform as or more reliably than Super High Grade Zinc and be easier to produce. They discovered that by alloying the zinc with small amounts of the elements aluminum and cadmium, an increased amount of iron could be tolerated. So, the sacrificial anode specification was changed to allow an increase in the iron content to 0.005 percent. Zinc anodes meeting this new specification and all of the subsequent specifications form a loosely adherent film that is principally zinc oxide. This film will readily slough off the anode's surface to expose fresh zinc alloy to the water, allowing the anode to be continuously electrochemically active. Thus, the zinc will not passivate. 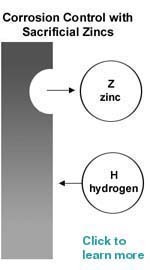 It is only through continuous electrochemical action at its surface that a zinc anode can provide corrosion protection for the metal structure to which it is attached. Installing zinc anodes that are not certified to meet the current U.S. Military Specification runs the risk that the anodes will be contaminated and will fail to protect the metals to which they are attached. Don't let corrosion eat into your investment - use our Mil-Spec anodes. 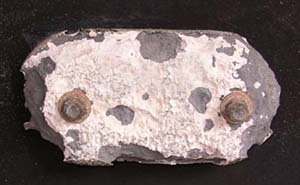 This lesser quality hull zinc anode (shown after a power wash) was fully encrusted in metal oxides that rendered it useless. Zinc anodes that meet Mil-Spec A-18001K will readily slough off oxides to expose fresh zinc alloy to the water and remain electro-chemically active.